This historic Colonial Revival style home in Dublin is reminiscent of the Gilded Age estates, situated on a gentle hill overlooking Dublin Lake and Mt. Monadnock. Stonelea’s park-like setting includes 31.55 acres of broad lawns surrounded by forest, and includes a waterfront lot with a boathouse on Dublin Lake. 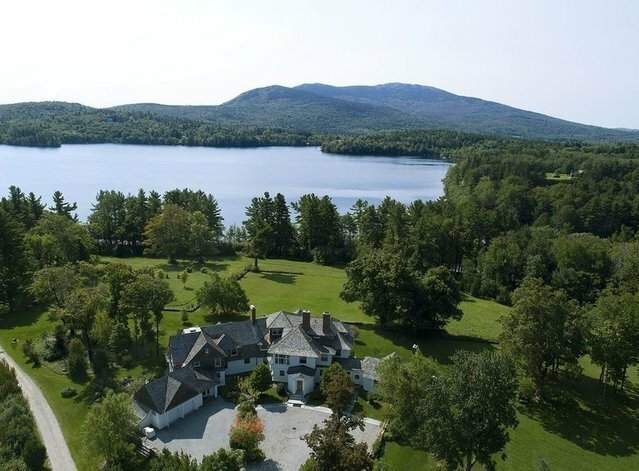 Originally designed as a summer home in 1891, the 12,632-square-foot structure was purchased in 2009 and completely restored and transformed into a magnificent year-round home by New York architect Hugh Hardy with local architect Daniel Scully, utilizing geothermal heat and solar energy. Gleaming hardwood floors, triple crown moldings, and several porches are just a few of the historic details that blend with updated systems, a more open floor plan, modern kitchen, an indoor pool room, 6 bedrooms and 7 baths. A sweeping staircase leads to the master suite, two ensuite bedrooms, and two additional guest bedrooms all with views to the lake and mountains. A third floor one-bedroom apartment with a large living room offers additional guest or bonus space.